The completion of a four-year £20,000 playing field project in the South Norfolk village of Wreningham has been celebrated with a village rounders match and team picture. The event, on July 4 at the Wreningham Playing Field, was attended by over 50 local children and parents and included a chance to play on equipment such as a climbing tower and slide, roundabout, zip wire and swings as well as the massive rounders match. The play area is now near completion after four years of fundraising from the Wreningham Play Project committee, comprising Jill Hustler, Nicky Morris and Claire Cormack. Over the past few years the committee has worked closely with South Norfolk District Council which has helped guide them in realising fundraising ideas which could work. Through the South Norfolk District Council Neighbourhood fund, the project was awarded a total of £9,300 which enabled it to make a good start in putting play equipment on the recreation ground area. 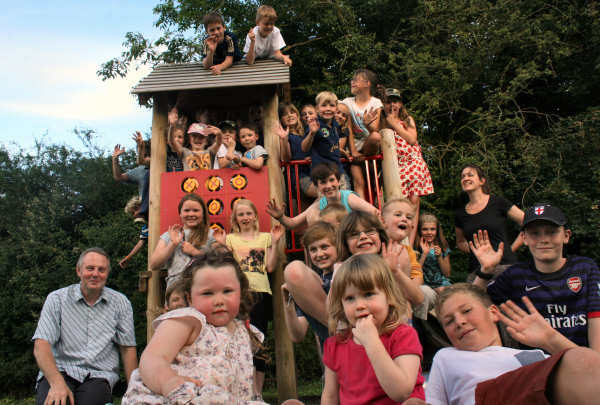 With further financial help including match funding from Archant and a donation from the Tesco Charity Trust as well as monies from the Parish Council precept fund, the committee have been able to raise nearly £20,000 to put in place a modern, varied play park. “The park was originally old and tatty with a couple of old swings and an unkempt dolphin springy,” said Claire. “It is now a modern, lively park area with varied amount of equipment for all ages – suitable for all the families who use the facilities after school and at the weekend. The park area is now a much more popular place for young people to visit with an increase in the numbers of families using the facilities after school and at the weekend. It’s great to have a place where young teens want to go and explore the outdoors,” she said. Pictured are children, parents and the project team on some of the new equipment.